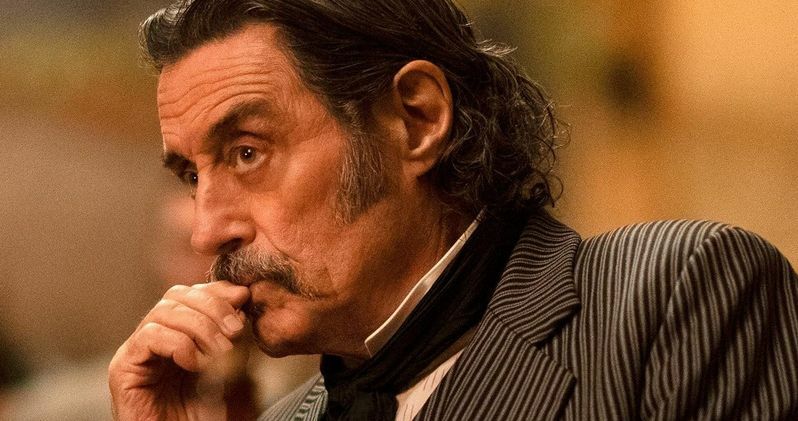 Ian McShane is one of the lucky few who has seen a cut of the upcoming Deadwood movie and he says, "it's good." Fans have been waiting since 2006 to see the long-promised movie. Series creator David Milch agreed to make a pair of two-hour television movies in place of a fourth season 13 years ago, but that never ended up happening. Over the years, the movie was talked about a lot, but there was never really any forward motion until 2016 when Milch was given the green light to write the script. Ian McShane is currently out promoting Hellboy where he plays Professor Broom from the comics and Guillermo del Toro's original movies. McShane was asked about the Deadwood movie and he gave quite a lot of information. The actor is closely associated with the franchise and he seems to be pretty pleased with what David Milch and Daniel Minahan pulled off. He had this to say. "Deadwood we just finished. I saw it the other day. Tim and I had a few comments. I think it's - yeah, it's OK. Yeah, it's good. Again it's, you know, don't expect an episodic piece. It's difficult when you've gotta make a two hour movie of an episodic TV. But I think they got the setting right, they got the links right, and they got everybody back which is really great, 'cause they could have made you know, 'Seth and Al ride the high country together!' That wouldn't have been Deadwood. That would just be me and Tim sort of catching it... this is (David) Milch Deadwood circa 10 years later. Statehood difficulty, characters have moved on; they're a little changed which is great." The first trailer for the Deadwood movie dropped a few weeks ago, which really set up the hype for the project. Even though fans knew production was underway and we saw set photos, it was still hard to believe for some that it was really happening after all of this time. Another bonus is the return of the original cast, which is a huge deal. We get to see some of our favorite character 10 years after the fact and how they've changed in that time. The Deadwood movie stars Ian McShane and Timothy Olyphant reprising their roles as Al Swearengen and Seth Bullock, alongside other returning cast members Molly Parker, Paula Malcomson, John Hawkes, Anna Gunn, Dayton Callie, Brad Dourif, Robin Weigert, and more. The characters of the series are reunited after ten years to "celebrate South Dakota's statehood and former rivalries are reignited, alliances are tested, and old wounds are reopened." In other words, it sounds like a perfect way to continue the story.